"The word farl originates from the Gaelic word fardel meaning four parts. These potato griddle breads can be made with leftover mashed potatoes too. 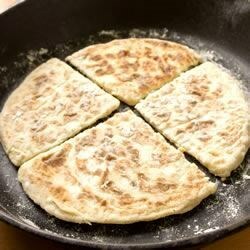 Serve hot with a little butter and salt, or fry them alongside soda bread as part of an Ulster Fry-up." On a well floured surface, knead the dough lightly. The dough will be sticky. Use a floured rolling pin to flatten into a 9 inch circle about 1/4 inch thick. Cut into quarters using a floured knife. We had these with the Ulster Fry-Up, and although I had told myself beforehand that I'd have only one wedge, I ate so many that I'd hate to admit to the actual count. Fantastic! These are delicious! I followed the PR's suggestion and doubled the butter and flour...mmmm...betcha can't eat just one!